But I’ve been using a solution called Fit, or the Framework for Integrated Testing, that bridges the gap between fuzzies and techies. In Fit, product managers supplement written word requirements with HTML or Excel Fit tables that express concrete examples. These Fit tables can easily be written by fuzzies in a HTML WYSWIG editor or Microsoft Word or Excel. There is something almost mathematical about writing out examples in this way, forming what domain-driven design philosophers might dub a Ubiquitous Language. These examples are both requirements and tests, saving you a step (and an opportunity for business needs to be lost in translation). Business rule: A 5% discount is provided whenever the total purchase is greater than $1,000. Well, row one names the fixture, or the code that hooks the test into the system under test. Row two has the headers, which label the two columns. The amount column acts as a given column, which specifies the test inputs (amount = purchase price in the business rule). 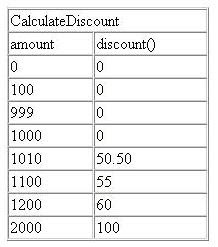 The discount column acts as a calculated value column, which specifies the expected output of the calculation. The calculated value columns are designated by the () brackets after the name. The rest of the rows are effectively our test cases, trying a variety of inputs into the system. Once a developer has written a fixture to hook this test into the system, the Fit test can be run, producing a report (see my report below). 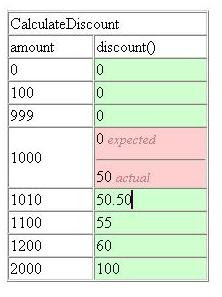 The calculated value column is colour-coded in the report: green=test success, red=test failure. Failed tests list the expected value and actual value calculated by the system, so you can investigate the discrepancy. In this case, the developers seem to have misinterpreted the requirement to provide the discount when the purchase is greater than $1000. The value of Fit is not only in more precise communication of requirements, but as an automated acceptance testing framework. With Fit, your requirements can be tested regularly to indicate to developers if new development efforts meet expectations, and if refactoring or new development has broken existing functionality.